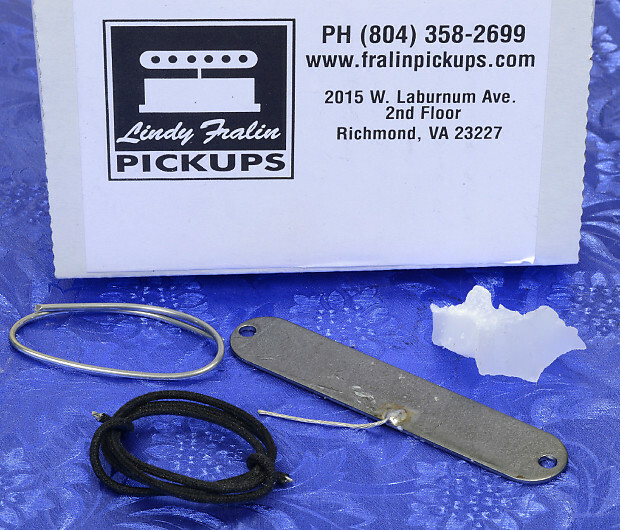 Lindy Fralin Steel Base Plate For Stratocaster Strat Bridge Pickups. Available as an option on Fralin Alnico poled Stratocaster bridge pickups, the Base Plate may be an interesting upgrade to try with other brands of pickups. Gives you 10% more bass without affecting the mids or highs! Simply installed on Alnico poled pickups; see Fralin's website for detailed E-Z installation instructions. Basically you just put a thin strip of masking tape over the bottom of the magnets, stick the ferrous Base Plate to the magnets, extend and solder the black ground wire on your pickup to the preapplied solder pool on the Bass Plate, hit it with a hair drier to flow the wax a bit to tame microphonics, let cool for three minutes and you're in business. There are oversize holes in the Bass Plate to permit the two pickup height adjustment/mounting screws to pass through. Brand New. Genuine Fralin. BONUS! We include more than enough cloth covered hookup wire, some audiophile silver solder and some real Fralin pickup wax. You won't find a better deal on the Fralin Base Plate anywhere on the planet. Prompt shipping with Delivery Confirmation in the USA is FREE! Check out Angela Instruments on the web for more hard to find Lindy Fralin Accessories and a whole lot more. Congratulations, you've received feedback on your sale of the Lindy Fralin Steel Base Plate for Fender Strat Stratocaster 10% More Bass From Your Bridge Pickup! 5 Stars! Another great Angela transaction! I love those guys. Fast, safe shipping, excellent products and communication. Highest recommendation! Scott N.
Congratulations, you've received feedback on your sale of the Lindy Fralin Steel Base Plate for Fender Stratocaster 10% More Bass From Your Bridge Pickup! 5 Stars Arrive quick safe and sound. Shawn S.
Congratulations, you've received feedback on your sale of the Lindy Fralin Steel Base Plate for Fender Stratocaster 10% More Bass From Your Bridge Pickup! 5 Stars! Works just as noted. Turned my bridge pup in my Strat to a tele clone.. Well close.. Shipping was fast! David S.
Congratulations, you've received feedback on your sale of the Lindy Fralin Steel Base Plate for Fender Stratocaster 10% More Bass From Your Bridge Pickup! 5 Stars! Great seller! Mike S.
Congratulations, you've received feedback on your sale of the Lindy Fralin Steel Base Plate for Fender Stratocaster 10% More Bass From Your Bridge Pickup! 5 Stars! Great service an price. Fast delivery. Dave W.
Congratulations, you've received feedback on your sale of the Lindy Fralin Steel Base Plate for Fender Strat Stratocaster 10% More Bass From Your Bridge Pickup! 5 Stars. These guys are always great to deal with. Good prices, quick shipping and well packed! Michael B.
Congratulations, you've received feedback on your sale of the Lindy Fralin Steel Base Plate for Fender Stratocaster 10% More Bass From Your Bridge Pickup! 5 Stars! Excellent response from the seller who exceeded all expectations. Dino G.
I will ship to any country that is covered by Reverb's Signature Confirmation and Seller Protection policies. Shipping rates may be higher for some countries than the International shipping charges posted on our Reverb sale page.